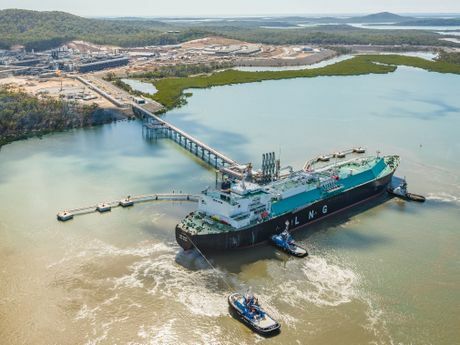 SANTOS has today launched the first LNG shipment from its $25 billion Curtis Island GLNG project bound for South Korea. Premier Annastacia Palaszczuk is in Gladstone today for the Malaysia-owned ship Seri Bakti's departure after it arrived in Gladstone Harbour on September 28. State Development Minister Dr Anthony Lynham and Member for Gladstone Glenn Butcher were also present to mark the milestone. THE LNG ship Seri Bakti arrived at the Santos GLNG site at Curtis Island in September. Santos Managing Director and Chief Executive Officer David Knox said today's announcement was the culmination of a historic journey for Santos. "This is the largest project we have ever undertaken as a company and I am so proud that we have been able to deliver this on time and within budget," Mr Knox said. LNG cargo ship arrives at Curtis Island : THE LNG ship Seri Bakti arrived at the Santos GLNG site at Curtis Island this morning. Project construction began in 2011 and has taken more than 95 million work hours from more than 10,000 people to date.